St Nicholas Church is the Anglican Parish Church of Canvey Island. About 80 people gather for the Eucharist at 8.30 on Sunday mornings and a further 160 at 10am. Evening prayer on Sundays at 6.30 and the Eucharist on Thursdays at 9.30 are appreciated by a wide cross-section of people. Whether you’re looking for somewhere to worship, or will be visiting for a special celebration, you will be welcome. 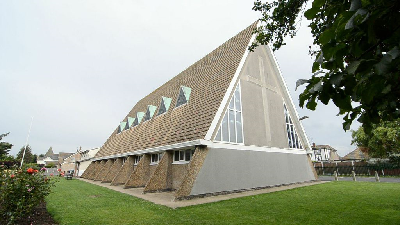 Prior to 1960, Canvey’s Anglican place of worship was St Katherine’s Church, now the Heritage Centre in Canvey Road. In 1957 the Church Council decided that St Katherine’s Church was too small. St Nicholas’ Church was built in 1960. In 1964 the Church Hall was built alongside the church, then in 1987 the two structures were joined together, where the coffee bar and parish office can now be found, completing the St Nicholas’ Centre as we know it today. Plans are currently underway to enhance the facilities further, so that we can better meet the changing needs of the community.